Splenic rupture occurs when the spleen is placed under intense pressure/duress, strong enough to tear or separate the outer lining of the organ. 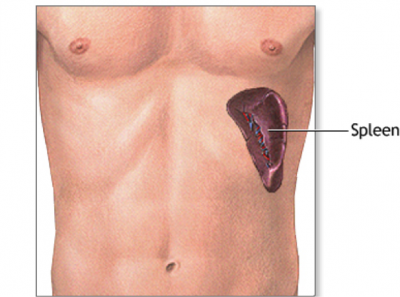 A ruptured spleen accounts for 10% of all abdominal injuries. When a blunt abdominal trauma is present, the spleen is the most frequently and often the only injured organ. Often, an athlete returning to contact sports following infectious mononucleosis are at potential risk of splenic rupture secondary to abdominal trauma. A splenic rupture typically results in severe pain and internal bleeding. However, some cases have exhibited only mild symptoms and symptoms may appear delayed as opposed to immediate presentation. Normal physical exams following abdominal trauma does not rule out a splenic rupture. Because of this, a splenic rupture is considered a medical emergency, both to repair/save the organ, and to limit the loss of blood from the cardiovascular system. The condition is usually caused by a sudden and direct blow to the abdomen, but spontaneous rupture is also possible if the spleen is enlarged or has been enlarged in the past, due to mononucleosis, infection, or chronic excessive consumption of alcohol. Often, an athlete returning to contact sports following infectious mononucleosis are at potential risk of splenic rupture secondary to abdominal trauma. It is important that individuals who have been recently diagnosed with IM meet with their doctor for clearance to return to sports. Premature return to sports with an enlarged spleen puts an individual at an increased risk for splenic rupture. Not all signs and symptoms occur immediately after a splenic injury. If this condition is suspected, continue to monitor the athlete for hours after the incident to see if signs or symptoms do occur. Some cases of delayed presentations show symptoms at 40 days post blunt force trauma. How do you treat an individual with a splenic injury? Once released from hospital, the athlete will need to follow gradual return to play over course of 2 or 3 weeks to allow healing of organ epithelial tissue. The athlete should be monitored very closely by an Athletic Trainer or sports medicine professional to ensure athlete safety and no return of signs or symptoms. Meehan, WP., Mannix R. A Substantial Proportion of Life-Threatening Injuries are Sports-Related. Pediatr Emerg Care. 2013;29(5): 624-627. Terrell TR., Lundquist B. Management of splenic rupture and return-to-play decisions in a college football player. Clin J Sport Med. 2002; 6:400-2.